So, problem solving, decision making, and goal achievement are all closely related functions of creative thinking. It's important that we keep this in mind. Next, you should write down everything you know about the problem. Third, decide whom to see. List the names of people and organizations that are recognized authorities on the problem. This is your opportunity to go "all out" for the facts. After determining who can help you, contact them, talk with them, and pick their brains for all the information they possess that can help you solve the problem. ...of each thing that's germane to the problem. Don't risk forgetting anything that could help you find the solution. This is personal "brainstorming," or thinking with the brakes of judgment off! Don't try to decide whether an idea is good or bad -just write it down the moment it comes to you. You can pick and choose - what you're after is a lot of ideas. Remember the four rules for brainstorming: (a) No negative thinking; (b) The wilder the ideas, the better; (c) A large number of ideas is essential; and (d) Combination and improvement of ideas is what you're after. This is your opportunity to put the minds of others to work on the problem. Handle this session the same way you did your "Individual Ideation." No negative thinking, no criticism at this stage; the wilder the ideas the better; get as many ideas as possible; and, try for idea combination and improvement. Write down all the ideas the group comes up with. Rate them for effectiveness and facility. The effectiveness scale ranges from "very effective" to "probably effective" to "doubtful." And the facility scale ranges from "easy" to "not so easy" to "difficult." The rating of ideas will clearly indicate the likely success of any possible solution. Of course, it's best to consider first the idea or ideas that are rated both "very effective" and "easy." There are many other evaluation yardsticks you might use. Two more are time and money. Try rating your ideas against these measurements. For example, in the case of a manufacturer who wants to increase its sales, certainly to change the product would take a great deal of time and money. And to advertise it on a popular network television program would cost a great deal. On the other hand, to introduce a new sales incentive program might be neither too costly nor too time consuming. Remember, when you evaluate your ideas, measure them against these four yardsticks: effectiveness, facility, time, and cost. Enter your ideas into an "Action Plan"
Decide who should do it, when it should be done, when to start, and how to do it. These are all important considerations because the execution of the solution is just as important as the solution itself. Be certain to give yourself a deadline for putting your plan into action. We work hardest and most efficiently when we know there is a definite time element involved. So, make a note of the date when you must put your solution to work. You might write down a second date -the one by which you intend to have the action completed and the problem solved. History is filled with people who believed a problem did not have a solution and they did not find it, and people who believed there was a solution and they did find it. Same problem, different perspective, one successful and one not. 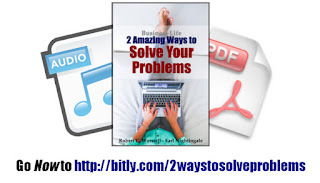 This is an excerpt from a new release on Amazon, "2 Amazing Ways to Solve Your Problems." Soon available on iTunes, Nook, GooglePlay, and Kobo. Get your complimentary PDF and audio files for this release - currently available only at LiveSensical.com.